When new visitors arrive on your website, your homepage is likely the first thing they will see. As a landing page that pushes your audience in the direction of the information or content they need, you have to ensure that your homepage is well designed. If it isn’t compelling, interesting, or attention-grabbing, it may be the only page they visit. Busy designs, difficult-to-locate navigation, and a lack of obvious calls-to-action can all make it hard for visitors to understand what they’re supposed to do when they land on your website. However, with the right homepage layout, you can push those leads into your sales funnel and nurture them into becoming paying customers. 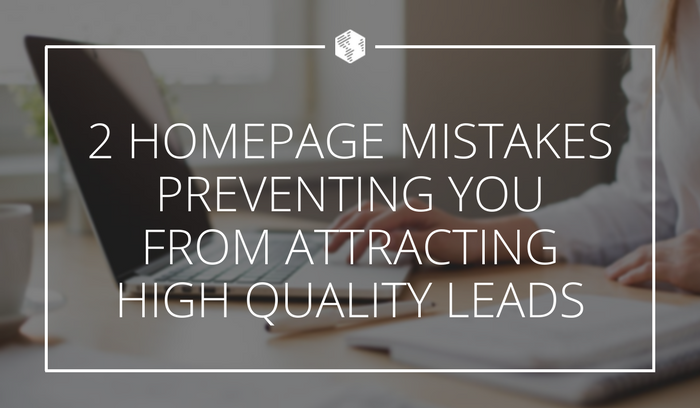 To help you design a homepage that appeals to your visitors and attracts more leads, let’s go over a few mistakes you may be making and how to fix them! A busy homepage design can cause your website visitors to feel overwhelmed or confused. Your navigation should be easy to find and simple to understand. Quality homepages have calls-to-action telling your visitors what next steps they should take. When a new visitor lands on your homepage, you want to catch and hold their attention right away. This means you need your homepage to be compelling. However, some people take this desire too far, and create a homepage that is busy or distracting. They include too many images and videos, or try and fit all their company’s information on one page, as in the above example from Gates N Fences. If your website’s homepage is too busy, it can cause a number of problems for your visitors. Not only does it make the website slow to load, which can push impatient users away, but it can also confuse and overwhelm them. If you’re trying to share too much information at once, your visitors won’t know what’s important or which page they should visit next. If they can’t find the information they’re looking for quickly and easily, they’ll often give up and move on to a competitor. Instead, your homepage should be clean and simple, and should clearly direct your visitors to more information, such as in the above example from Prezi. While you may be tempted to include as many details as possible on your homepage (in fear that your visitors won’t click through to other pages), drawing users off your homepage quickly can help you maintain a better user experience. Focus only on the basics when it comes to your homepage, including who you are, what you do, and what you can accomplish for your potential customers. Before you begin designing your homepage, you’ll also want to consider the roadmap your visitors will likely follow. This is the path a typical website visitor would take to learn more information about your company. Depending on what you offer, there will likely be a few different directions they can follow. As you design your homepage, keep those paths in mind, always making sure visitors can easily move from one page to the next to learn more information about you. Your navigation should serve as a map for the rest of your website. If your visitors know what information they need or what content they’re looking for, they should be able to quickly locate it. Unfortunately, many people forget about the importance of their website’s navigation. Instead, they prioritize navigation that is unique, or put it in difficult-to-locate places. The above homepage from Creative with a K is interesting, for example, but nearly impossible to navigate. Website visitors will have certain expectations about the layout of your website, including where your navigation is located. While you may have a creative or fun idea about how to display your navigation, you always want to consider the users’ experience first. This means you should keep your navigation prominent and easy to locate, and place it in a predictable place such as the header or left sidebar. When creating your navigation, you’ll also want to think about the pages your audience might be looking for. Keep the path to those pages as streamlined as possible. If you have too many items within your navigation, this can cause your visitors to become overwhelmed. Instead, stick to a handful of primary categories, which you can then break down into subcategories if necessary. When new visitors arrive on your homepage, it may be their first experience with you as a company. If they don’t know what information they should be looking for, they’ll expect you to nudge them in the right direction. This means you want to prompt them towards more content and other important pages with strong calls-to-action. Without a clear call-to-action, many visitors will simply come to your homepage, view its content, and then move on to something else. If they’re not compelled to learn more about you as a company or what you can offer them, you’re missing out on an opportunity to capture a new lead or convert a new customer. Your calls-to-action should consider the pathways your visitors might take when they arrive on your website, as in the above example from Jib. If you’ve already created a website roadmap, you can easily create calls-to-actions that properly nudge your visitors towards the content they need and the actions you’d like them to take. The number of calls-to-action or pathways you need to include will depend on what you offer and the industry you serve. Most importantly, consider the questions, concerns, or problems your visitors may be experiencing when they come to your homepage. When your calls-to-action reflect real needs and desires, your audience will be more likely to click through and engage with further content. Your homepage is the most important part of your website. If you’re not thinking through how its design will influence your visitors’ experience, you could be missing out on high-quality leads. By creating a homepage that considers what your visitors are looking for when they land on your site, you can attract more attention and improve your leads and conversions. Make sure your homepage is interesting, without being too busy or cluttered. Put your navigation in an easy-to-locate part of your website, and make it simple to understand. Include a clear path for your visitors to follow, by using compelling calls-to-action. How do you think a stronger homepage will help you attract better leads? Let us know in the comments section below!